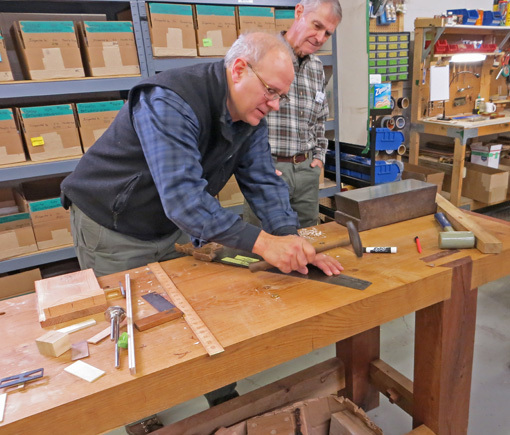 I recently had the wonderful experience of attending the two day seminar on saw sharpening and tune up at Bad Axe Tool Works, along with about a half-dozen other enthusiasts, presented by BATW owner and founder Mark Harrell who was assisted by his impressively skilled crew. I learned a lot, starting with the realization of how much there is to learn. Several key aspects of making a world-class saw stood out. First, and I think foremost, is hammer setting the teeth. For a very long time I stayed away from even the best available Western backsaws, instead preferring Japanese saws. 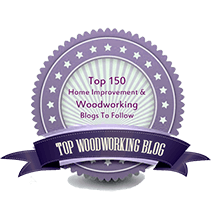 The best way I can describe the problem that I felt with the Western saws that I tried was an annoying subtle vibration or tension at the bottom of the kerf. Bad Axe saws are decidedly different. They transmit a palpable sense of resolute ease and smoothness as the saw cuts, which, frankly, raises my confidence as I track a layout line. The teeth undergo sophisticated hammer setting that relieves them of the stress and saw plate distortion induced by merely bending over the spring steel teeth, problems that ultimately transmit unease to the hand of the sawyer. Second, I learned how the folded sawback does more than merely add weight and stiffness to the saw plate. It almost magically contributes to making the toothline dead straight. In fact, it can be rather easily adjusted if needed to straighten an errant toothline. This is quite different from the saw plate being fixed in a sawback with a milled slot. Further, all of us were especially grateful to learn that excellent saw sharpening does not have to be complicated. Mark coached us through real deal sharpening techniques that we could bring home and directly use in our shops. What a relief! In particular, we all saw the value of Mark’s “hybrid” sharpening pattern that uses intermediate rake and bevel (fleam) angles to produce a toothline that is remarkably versatile in the shop. As I thought more about what I learned that weekend, a couple of rough analogies came to mind. In writing and classes on sawing technique, I emphasize how core stabilization and balance are essential for steady ease and control of the distal motion of the hand and saw, somewhat similar to the how tension of the heavy folded sawback produces precision at the toothline. Producing these saws involves automated steps early in the process with increasing amounts of hand skills that infuse exquisite quality, culminating in sharpening. 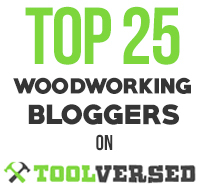 This is analogous to how most of us make high quality woodwork. We prepare stock with machines but the special quality comes from skilled handwork. 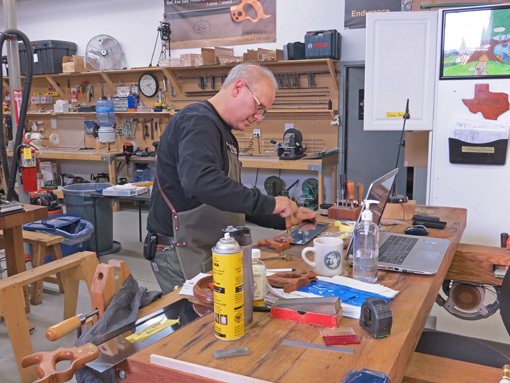 In summary, the seminar brought me to appreciate the depth of understanding and refinement of craft for each element of making the saw, and I could see how it all comes together to produce the saw performance I have been experiencing. And of course, the customization options available from Bad Axe are irresistibly cool. Without doing controlled side-by-side tests, I have had the opportunity to try at least one backsaw by almost all of the high quality American and Canadian makers. I generally shy away from superlative statements but here goes: these Bad Axe saws are hands down the best. And they are indeed tools with souls. Above, Mark Harrell is finishing work on my 14″ sash saw and yea, I’m happy. Articulate, accurate and succinct. Wish I’d said that. Enjoyed meeting you at the seminar. Thanks, Leo. I enjoyed meeting you too. You nailed the feeling of hammer set teeth Rob. I have some early Bad Axe saws before Mark started doing this and while still outstanding the difference is tangible. Mark keeps telling me to send them back so he can hammer set them, but I have a hard time parting with them even now as I used them just about every trip into the shop. Mark needs a loaner saw program like a car dealership! Thanks, Shannon. Long story short, I agree with your assessments of the saws. I bet you’d really appreciate Mark’s saw seminar and it would be a perfect occasion to upgrade your older saws! Mark’s level of knowledge and skill is awesome. I’m having trouble finding much info on hammer setting online anywhere. Can you recommend a brand or model of hammer setting tool, or is mark free handing this? Mark uses a few different devices, none currently manufactured. You might try used/vintage tool sources. Also note that Bad Axe has a full range of saw restoration and tuning services available at reasonable prices.